At the company I work for, we are using Zabbix to monitor our infrastructure and in some case we are using “traceroute” to keep an eye on our network from different locations. By keeping a traceroute history, it can help you to understand some networking problem by example when you are facing packet loss from some location. To keep this history in Zabbix, we are using “MTR” instead of the traditional “traceroute” command. in a single network diagnostic tool. running statistics about each machine. 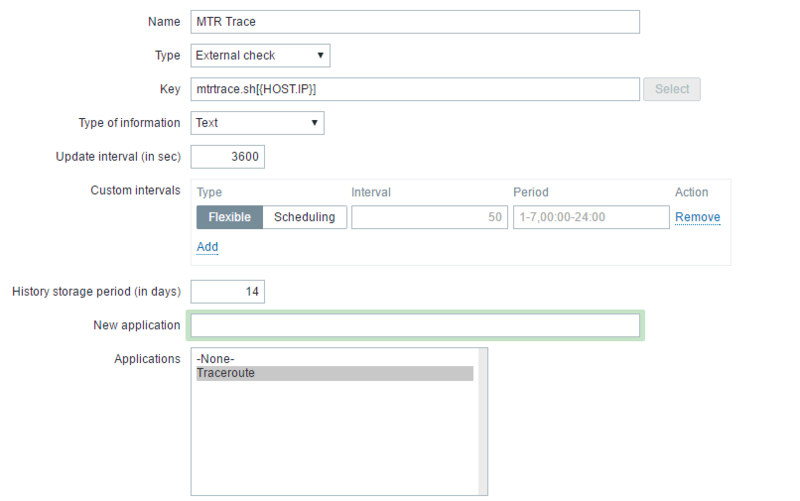 MTR is installed on our Zabbix proxies and on the main server. As we are using proxies and active agents, the remote commands are not supported. So we have deployed a local script on the server and proxies. This local script is named “mtrtrace.sh” and is saved under the “externalscripts” directory of Zabbix. The path can be found in the proxy or server configuration file under the following configuration key : “ExternalScripts“. Under Debian it’s “/usr/lib/zabbix/externalscripts“. It will use the first ” IP address” in the “Agent interfaces” part of the host configuration. You will find the history of data under the application “Traceroute” and in the item ” MTR Trace” on the “Latest data” tab of the configured host. Please note that, it’s recommended to increase the “Timeout” value in the Zabbix Server and Proxies configuration files to use this script. On my side it takes 10 seconds in average to be completely executed. A few weeks ago, while analyzing a customer’s network, I’ve discovered that their QNAP NAS was making a lot of outgoing connections on UDP port 6881. Knowing that this NAS is only used as an internal repository for Veeam backup, I knew that this traffic was not wanted. After a quick search, it appears that this port is a BitTorrent port. This search confirms that this is an unwanted network traffic. So, I’ve looked up on the QNAP documentation and forum, and I’ve discovered a post that was speaking about this problem. This problem is linked to the package “Download Station” that is installed on this QNAP.